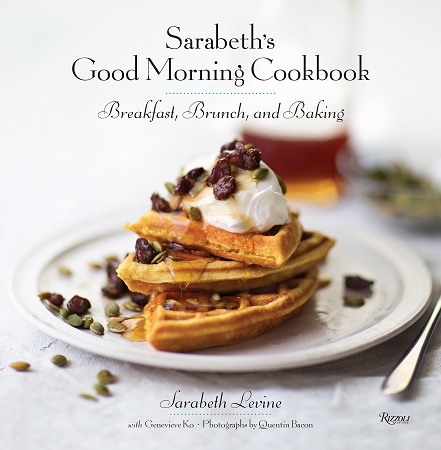 Every copy of Sarabeth’s Good Morning Cookbook: Breakfast, Brunch, and Baking, we sell is personally signed by Sarabeth Levine. It comes to you with a personalized gift card upon request. This item will ship out via USPS First Class Mail, free of charge, regardless of which shipping method is selected at checkout. If you would like to select a different shipping method, please contact customer support at 1-800-773-7378. Additional charges may apply. Sarabeth’s book, entitled Sarabeth’s Good Morning Cookbook: Breakfast, Brunch, and baking, published October 13, 2015 (Rizzoli, 288 pages) is available for purchase. In this must-have collection of over 130 classic morning recipes, Sarabeth delivers the comforting dishes she makes for family and friends, from fluffy scrambled eggs to warm sticky buns. In 1981, she launched her first weekend breakfast/brunch menu. Today, lines queue at her New York City restaurants, as well as at her Key West and Japan locations. Her fans will be thrilled to recreate the delicious dishes of brunch at Sarabeth's with recipes designed for home cooks. A comprehensive guide to morning meals, this beautifully photographed book features scrumptious dishes everyone will love. Sarabeth's signature pancakes and muffins are quick enough for weekdays, while her creamy tomato soup, quiches, and coffeecakes are guaranteed to improves weekend guests. In addition to her sophisticated twists on the standards, Sarabeth surprises with breakfast treats like morning cookies, hot cereal soufflés, light and fluffy omelets, and sweet and savory spreads. The easy-to-follow recipes come with technique tips and make-ahead instructions that guarantee effortless entertaining. Sarabeth Levine has earned the James Beard Award for Outstanding Pastry Chef. Her line of jams is sold in thousands of stores in the U.S. and abroad, including Whole Foods and Williams-Sonoma. She has been featured in numerous publications, including the New York Times and Bon Appétit, and has made many television appearances. Rick Rodgers is the author of over thirty cookbooks, including the IACP-nominated Kaffeehaus. Quentin Bacons photographs have appeared in many cookbooks, including Margaret Brauns Cakewalk, as well as leading culinary magazines. Mimi Sheraton writes for the New York Times, The New Yorker, and Vanity Fair, among other publications. Her books include The German Cookbook and a memoir, Eating My Words: An Appetite for Life.